I remember it like yesterday. The first contraction. I mistook it for gas pain and blamed myself for overdoing the chaat at dinner. With the second contraction, I knew it was time to pack the hospital bag. About 5 hours later, our little Ram was here cute as a button. I remember it like yesterday. The first year of being a mom of two children. The work, the pumping, and the sleep deprivation were hard. But the lack of involvement and bonding with Hari was much harder and took me off guard. I remember it like yesterday. The first tantrum. It was during our visit to NJ, a month before his second birthday. The child was having a full blown meltdown and nothing comforted him. He taught me a very powerful life lesson that trip. That time and space are the best antidotes for someone in distress. In fact, it’s a magic pill for most of us, most of the time. That sometimes you make it worse by wanting to make it better. That most times, letting it be is the best place to be! I remember it like yesterday. His first time being away from me. His toilet training. His first day at preschool. His first time going on merry-go-round. His first time getting into a pool. His first movie. His first time going to summer camp. Ram will turn F-I-V-E years old tomorrow. The years, and the milestones flash in front of my eyes like a movie playing in fast forward mode. He is soft, and tender. But let that not mislead you into thinking that you can trample him. This child is not afraid to speak his mind, even when he is afraid. He brightens our lives with his zest for life. Can we buy a hammock? did you see the rainbow dancing on our table? He is very decisive and does not get easily overwhelmed by choices. He doesn’t like to be in the limelight but thoroughly enjoys company. He is very thoughtful – always saves a treat or makes a card or offers a helping hand. A lover of words, and nurturer of plants, he is our little charmer. Here’s wishing Ram happy fifth. Thank you for coming into our lives love and making it richer and livelier. We love you with all our heart. God bless you child. One of the things that wowed me when I first came to the US was the public library in my town. The sheer size of the building, the breadth and depth of of books, CDs, videos and DVDs, the ability to borrow a boatload of them for free, the concept of library passes for museums and aquariums, the general peace and quiet in the building. Suffice to say my respect for my new home country climbed several notches higher after every library visit, which was a daily affair during the first few months. Fast forward a decade, my admiration has not diminished an iota. If at all, the minions of the house have taken it to the next level. Our week is amiss without a visit to the library. 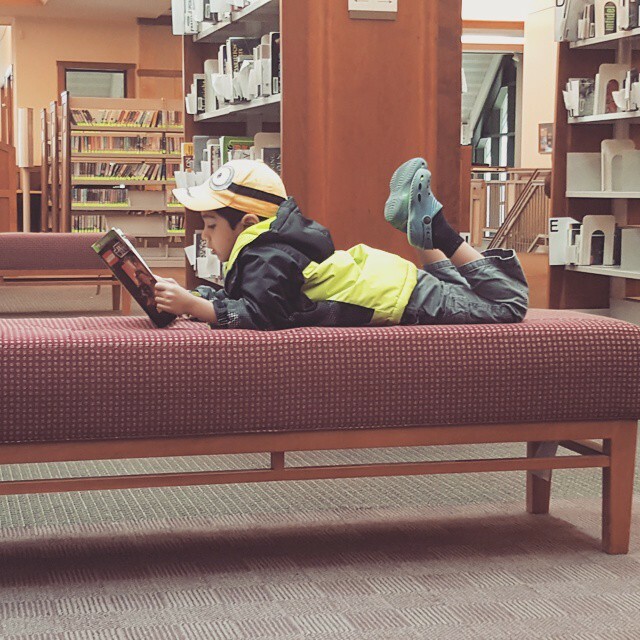 Once in the library, we stick to a certain routine that we have developed over the numerous visits. Hari heads to the comics section, and then to the fiction. I tag along with Ram to the DVD section, then to the lego display, and then to his books. We pry the collection to see what catches our fancy for the evening. Once his needs are met, book in hand, Ram follows me to the adults section. He lies down comfortably on his belly on the bench, swinging his legs, as he hungrily studies the details on his borrowed book – he doesn’t know to read yet but I have not seen a more voracious reader. I browse through the “Read Now” section and recently returned books with the secret conviction that there is a book waiting to come home with me. Then, the three of us settle ourselves in the comfy couches and lose ourselves to the written word. For those few minutes, life sure is at its best! Given how much we cherish our library visits, little wonder that we have a vested interest in making it a better place. So when an opportunity to give back to the library knocked at my doors, I grabbed it with my hands, legs and what not. With seed of an idea, a small group of like-minded folks got together to plan a fundraising event over the past few months. Our work came to fruitation last weekend. While we cannot claim to have had runaway success, my heart feels full knowing that we made a difference. As a side benefit, I also got an opportunity to hone my mediocre sari tying skills and be a cultural ambassador for the Indo American community in my own small ways. The first week of school year is glamorous. Makes you feel alive, refreshed, and productive. It doesn’t take long for it to lose some of it’s sheen though. We are only in the second week, but my eyes are already scanning the calendar for the next long weekend. Hint: extra curricular activities in full swing starting this week and work travel in second half of next week. Need I say more! Hari had his baseball tryout for travel team last night. The child was exuberant, “I am so proud of myself. I think I did well”, he said jubilantly. I didn’t want to squash his excitement but gently reminded him that the result could go both ways. He analyzed a bit – how good is he compared to some of his other friends who qualified and concluded that the odds favor him. I was tempted to keep it real and protect him from possible heartbreak but I resisted and let it be. Ram’s fantasy of the day – owning a dog. “If he is green, I will call him grassy. If he is brown, I will call him branchy. We need to buy dog food, and we need to buy a bowl to put the dog food in. I want him to be furry and small”. I had to remind him, “Ram I don’t think we will get a dog”. That did not stop him from planning the details of what he would do if we had a dog. What is life without hopes and dreams, isn’t it?